Sure, we may offer our customers Blow and Cocaine over in our Caffeine section, but we generally draw the line when encouraging anyone to Ride the Dragon. Until now, that is. 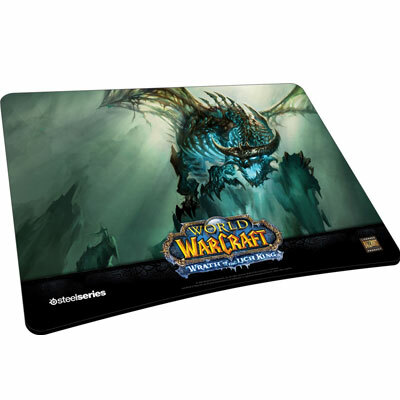 Sporting a finely detailed textile surface that displays an impressive dragon design, the SteelSeries 5C Limited Edition Mousepad (WOTLK) is one truly gorgeous computer accessory that's perfect for fans of World of Warcraft. This finely detailed textile surface features a specially designed compressed fiber fabric which is superheated and laser cut, which results in a gaming surface that delivers consistent friction and glide. This impressive feature allows players to fully increase their precision and accuracy. Featuring a surface that's been thoroughly tested and approved by leading professional gamers, SteelSeries 5C Limited Edition Mousepad contains multiple layers of compressed synthetic fibers and plastic that helps to maintain both shape and stability. This Ultra-Limited Frost Wyrm Edition displays an insanely cool dragon graphic from the World of Warcraft® expansion pack "Wrath of the Lich King™".